Roseau, Dominica – (January 24, 2018) Discover Dominica Authority (DDA) in collaboration with the Dominica State College (DSC) embarked on a “Dominica’s Tourism Product Post Hurricane Maria” training series. The three part training series targeted Tourism Frontline Personnel such as Tour Guides, Taxi Drivers, Tourism Information Officers, Hotel Front Desk Personnel, Custom Officers and DASPA Security Personnel. The objective of the workshop was to ensure tourism frontline personnel are equipped with information as it relates to Hurricane Maria’s impact on the island’s architecture and flora fauna. 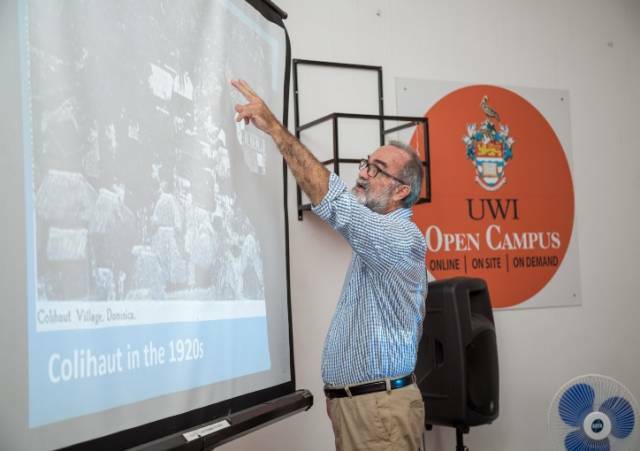 Additionally, the workshop sought to assist the service providers such as the tour guides in positively incorporating the post Hurricane Maria landscape into their tour narration. The workshop was facilitated by Dr. Lennox Honychurch who presented on ‘The History of Hurricanes on Dominica and their Impacts on its Architecture’ and Mr. Cyrille John, Forestry Officer, who presented on ‘Recreation & Parks’ Roles in the Replanting of Trees and Ornamental Plants at Specific Sites’. The final session in the workshop series was held on Wednesday, January 24, 2018. Ninety five (95) individuals participated in the training series.